Triblend fabrication creates a light textured effect. 3/4 sleeve. Crew neck. 40 single. Triblend fabrication creates a light textured effect. Side seams. Weight: 135g/m². Fabric: 50% polyester 25% combed ringspun cotton 25% rayon. XS (31-34: To Fit (ins)), S (34-37: To Fit (ins)), M (38-41: To Fit (ins)), L (42-45: To Fit (ins)). XL (46-49: To Fit (ins)), 2XL (50-53: To Fit (ins)). 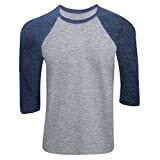 This entry was posted in Baseball and tagged Baseball, Canvas, Mens, Sleeve, TShirt by FPSports. Bookmark the permalink.